Joseph Bramlett, now a junior fighting an injury, was 2nd team All-American as a freshman. Joseph had the lowest stroke average on the team before his injury. He writes about his team and his injury. He was recently featured in an ESPN article. "With daylight savings behind us the spring season is now in full force and Stanford golf is right on track. Watching the guys win in a dominant fashion two weeks ago was nearly as exciting as being there myself. Ziggy’s huge finish down the stretch making birdies on a tough course to win the individual title and run away with the team title is just another push forward for us as a team. At one point in the final round we had five golfers in the top ten which goes to show the depth that were starting to find as a team again. We have been working hard all year and we can feel that it is finally starting to click. For me personally it has been a very trying quarter. I injured my wrist during finals week of fall quarter and have been unable to get back to practicing yet. It has been frustrating at times, however with the physical limitations that have been placed on me I have tried to grow in other ways. I’ve found things in my game that I can work on without a club and hopefully make my transition back into playing a little bit easier and faster. I definitely learned a lot about returning after an injury last year and although there is nothing enjoyable about not being able to play, I am extremely motivated and excited to get the chance to play again. It’s amazing how many people take this game for granted and my appreciation and love for the game has definitely grown. Seeing the guys play so well and the momentum that comes with it makes me want to get back even faster. Hopefully the guys can keep up the good work and I will be able to help them out a little down the closing stretch of the season. I’m trying to stay patient, as everyone has reminded me, and hopefully come April and May this will pay off." 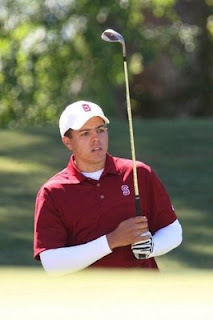 All Cardinal fans are pulling for Joseph to fully recover from his injury and return to the links again soon!